Happy New Year, blog friends! 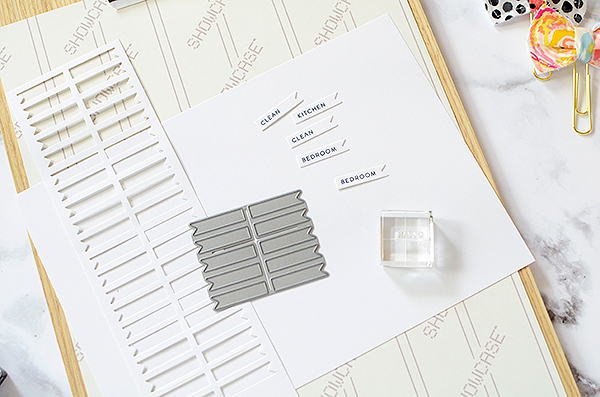 It's that time when the urge to purge, declutter, deep clean, and reorganize hits many of us. For me, the feeling came on fairly strong after Christmas and 2 weeks later, I've still got the bug. 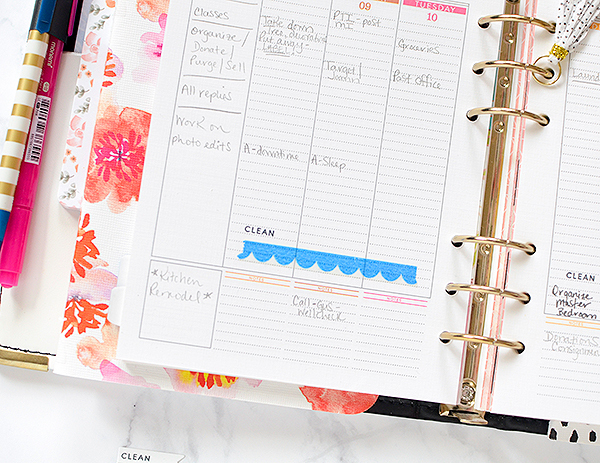 It's so bad, in fact, that I developed an entire cleaning/organization schedule to stay on top of it all (because normally, housekeeping isn't my greatest endeavor). 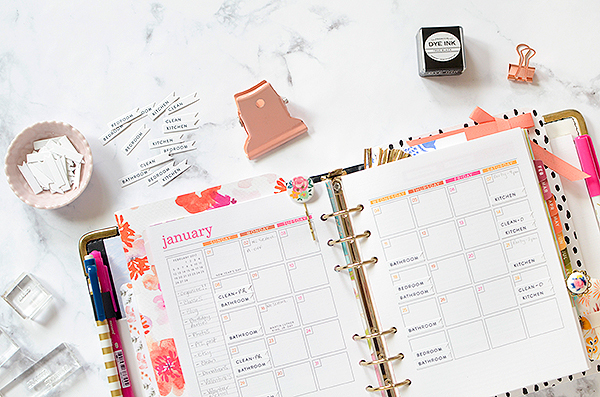 In my post today, I'll share how I've used a few supplies from the Papertrey Ink Moments Inked Planner System to help me stay on task. First off, I made a decision not to make many plans or jump back into work this January. 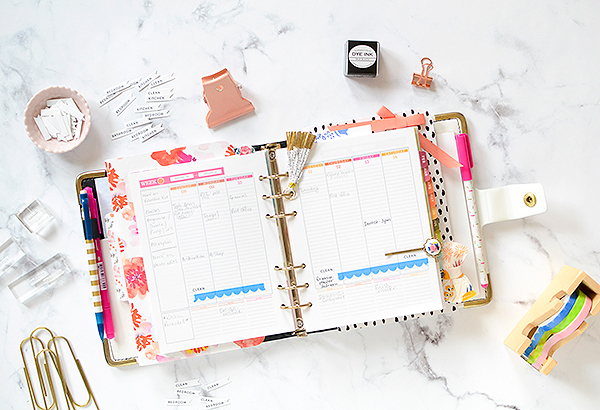 I've spent the last 3 or 4 years running head first into design team work and my Etsy shop business, and that leaves little time for massive organizational efforts. 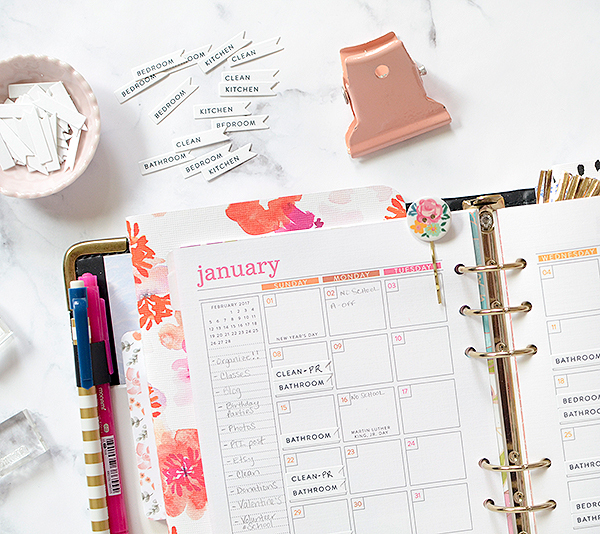 What I've experienced is just the opposite of orderly and the entire year becomes cluttered and disorganized and I'm always two or three steps behind the game. (It's usually due to the fact that my studio space is never decluttered enough so it ends up spilling over into other areas of our house, thus there is always a pile of something somewhere (and more often than not it's five or six piles) and I never know where anything is. So this year I opted out of doing that and instead, I'm overhauling every room in the house. We did the kids' room over the holiday break, along with their playroom. Now it's time to tackle the master bedroom and the studio, followed by the kitchen and living area. Things will get thrown out, donated or sold if there is not a space for them, and 2017 will be the year of order, not disorder. And while I'm at it, I decided to make a cleaning schedule so that (ideally) we don't have this much chaos in the future. Lest you think we're just a bunch of dirty animals, I'll say that I don't really mind cleaning; finding the time to do it is the most difficult aspect of it. There is always something else that needs to be done--work, kids' activities, cooking...The cleaning is just the thing that gets put off the most because something more pressing needs attention. But I've realized that the more often you clean, the less time it takes! Duh, right?? I'm sure you already knew that. Giving things a quick wipe down every week takes 20 minutes, as opposed to the 60-90 minute sessions that take place if I go 3-4 weeks between big cleans. Twenty minutes is much easier to find than 90 in a busy schedule so this makes much more sense--and, bonus, the house will be clean! With this in mind, I set out to create a working schedule. As I mentioned above, my Moments Inked Planner System has all the tools I need for this. 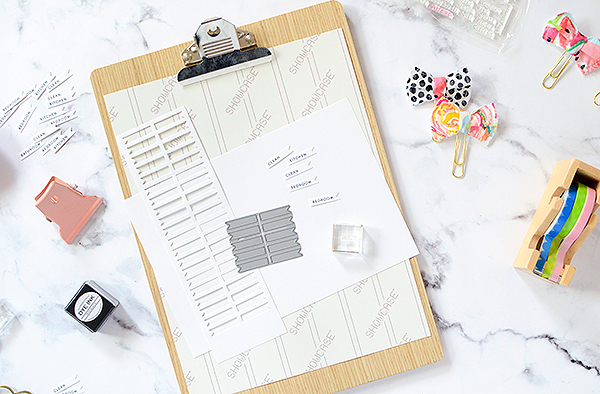 I grabbed the Everyday Symbols stamp set, True Black Ink pad, Planner Banner die, and some White Adhesive Sheets. Oh, and my planner, of course! I cut 80 little banners from the adhesive paper; 80 should last several weeks and then it'll be time for another round of cutting. 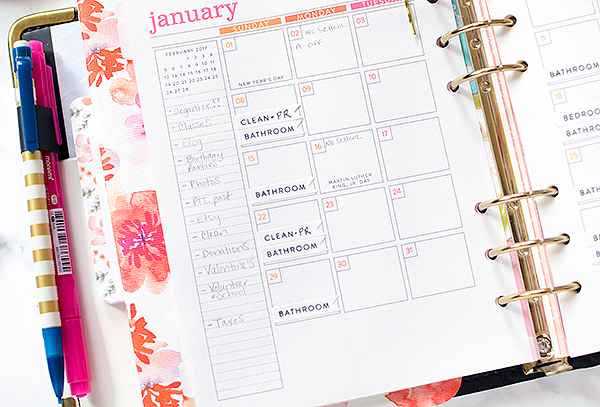 My fingers are crossed that I'm still adhering to this cleaning schedule 4 months from now! Next, I stamped different rooms on each banner. In my case, I needed kitchen, bedroom, and bathroom. (Living room, dining room, attic, and garage stamps can also be found in the stamp set.) Our living room is part of our dining and kitchen area so I will be cleaning those when I do the kitchen. There are 2 rooms I need to clean that do not have stamps, the playroom and the office. Instead, I simply stamped clean and initialed 'O' for office and 'PR' for playroom. 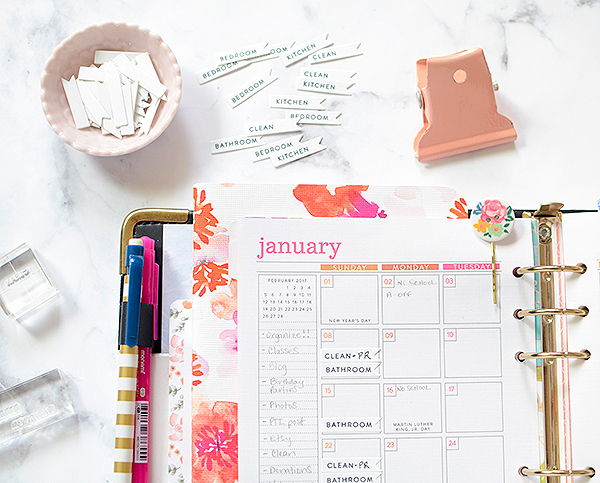 The banners have the sticky backs so they're easy to attach to the planner pages. I devised a workable schedule and placed the banner die cuts where I wanted them. I've designated Wednesdays and weekends for the cleaning, and decided that each bathroom and the kitchen would get done every week, while the rest of the rooms will be tidied up every other week. A quick wipe down or vacuum each week can be included as needed, but I didn't feel it was necessary to include those. I also chose to adhere the banners on the month-at-a-glance page instead of on the weekly layout because I can get a better idea of the entire schedule this way. Being that I've already made so much more progress on getting this crazy house in order than ever before, I'm confident I'll be able to continue on the path to get (and stay!) clean and get (and stay!) organized. 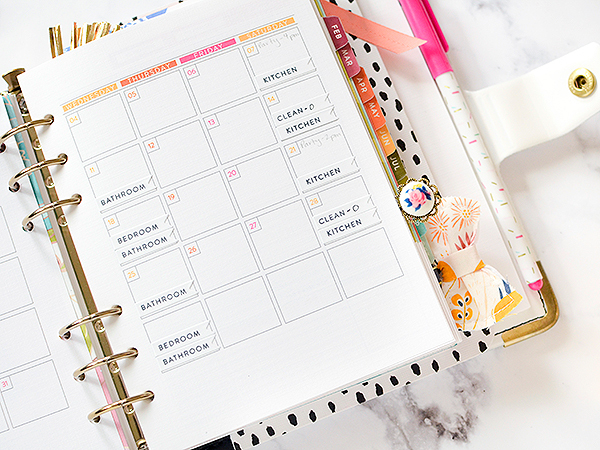 Even my planner pages look neat and tidy with this system--which oddly helps me find motivation! This is a great post! I need to get my act together on cleaning. Other than working during the day (remotely from home) and having 3 cats and 2 dogs, there really ISN'T an excuse. I have several things on my "to do" list for organizing and cleaning... 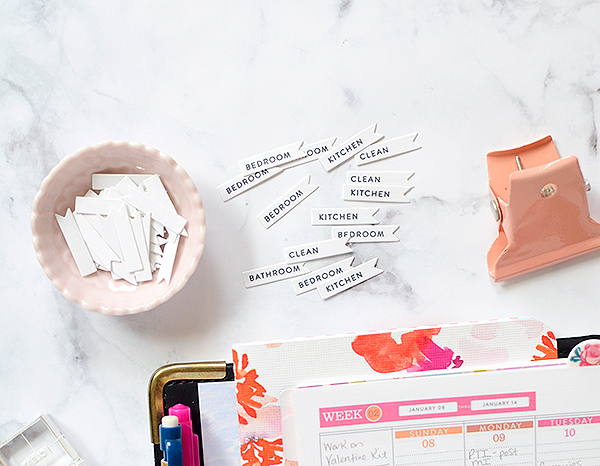 Organizing is fun, cleaning? Well, cleaning is kind of fun too... except for having rheumatoid arthritis in my hands and having a bad back. But keeping the cleaning limited to a room or so at a time on a regular basis is so much easier than power cleaning every so often. (20 minutes is easier on my hands than 90 minutes.) :) I'm going to sit down and do this soon. (Ha! I can't commit to TODAY.) ;) Thanks again!! I too am in the decluttering mode, and trying to come up with a way to incorportate it in my planner. Your ideas certainly help to keep it decluttered. Just seems like a daunting task to get it under control to begin with. As for cleaning, have you tried Norwex products. You clean with just water. The Envirocloth and Window cloth are all you need to get started. You won't believe how clean everything will be. 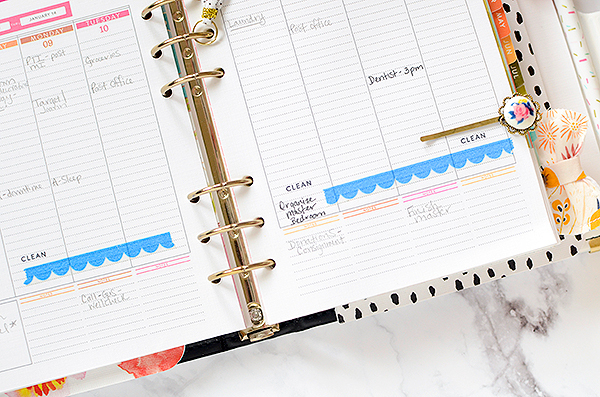 Your planner looks great. There is nothing quite like the feeling of getting things under control. I basically use just two things when cleaning most of my house...certainly all the yucky bits like bathrooms and kitchen. I use plain ordinary vinegar and baking soda. I wipe down the bathroom sink every day by giving a quick spritz of vinegar and a wipe and do the whole bathroom once a week. If it needs a little bit more love I dump in a handful of baking soda and top that with vinegar and a bit of boiling water. Lots of bubbles and clean..clean..clean. Bingo...the penny dropped and I love the Month at a Glance pages for this task. But I'll be stamping a small block and hand writing instead of die cutting and stamping. Thank you!